The FT900 and FT902 micro-controllers by FTDI/Bridgetek are designed for embedded control applications, requiring low-power consumption. The MCU family features a 100-MHz processor core. On-chip are 256 KiB flash memory and 256 KiB shadow program memory as well as 64 KiB data memory. The products are equipped with a broad range of interfaces such as Ethernet, SPI, USB, etc. On chip are also two independent CAN modules supporting Classical CAN frame formats (11-bit IDs and 29-bit IDs). The CAN implementation supports bit-rates up to 1 Mbit/s. Hardware frame filtering with dual- or single-filters is possible. The receiver unit provides a 64-byte FIFO and the transmitting unit features a 16-byte FIFO. The CAN interfaces are compliant to ISO 11898-1, but do support user-generated overload frames. Besides normal mode, the CAN core can be used in listen-only mode. The error counters are readable and pending transmission request can be aborted. Bridgetek is a semiconductor company providing MCUs and display ICs. The company is headquartered in Singapore with additional design centers in Glasgow, Taipeh, and Ho Chi Minh. 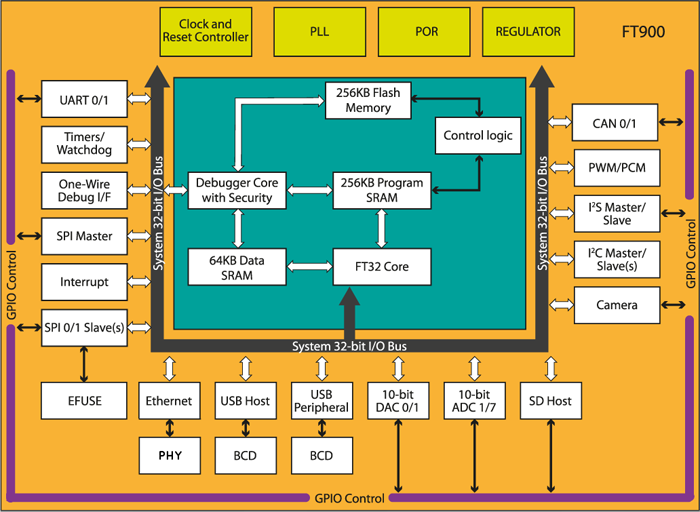 The chipmaker also provides a HMI (human machine interface) display series, namely the Embedded Video Engine (EVE) graphic controllers, in which display, audio, and touch functionality are combined.